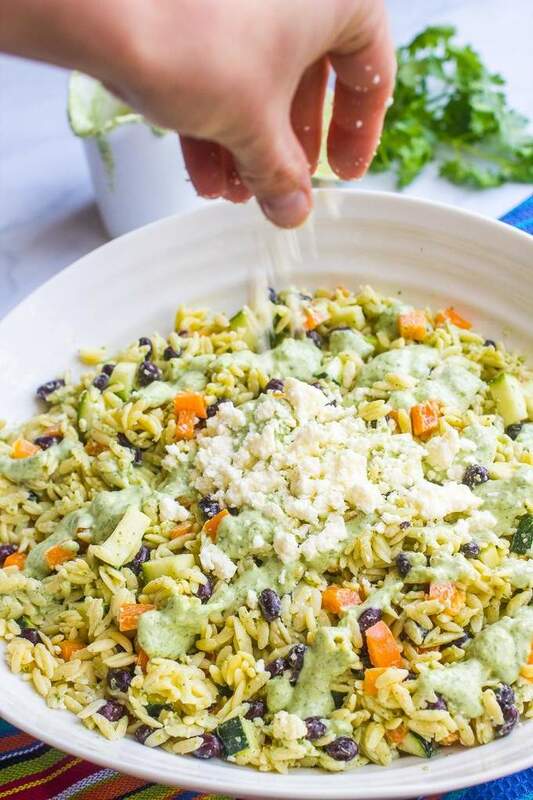 A cool, creamy southwestern orzo salad with black beans, veggies, queso fresco and an easy homemade cilantro-lime vinaigrette! Like this southwestern orzo salad. And I’ve also got a fun blog-hop for you today! 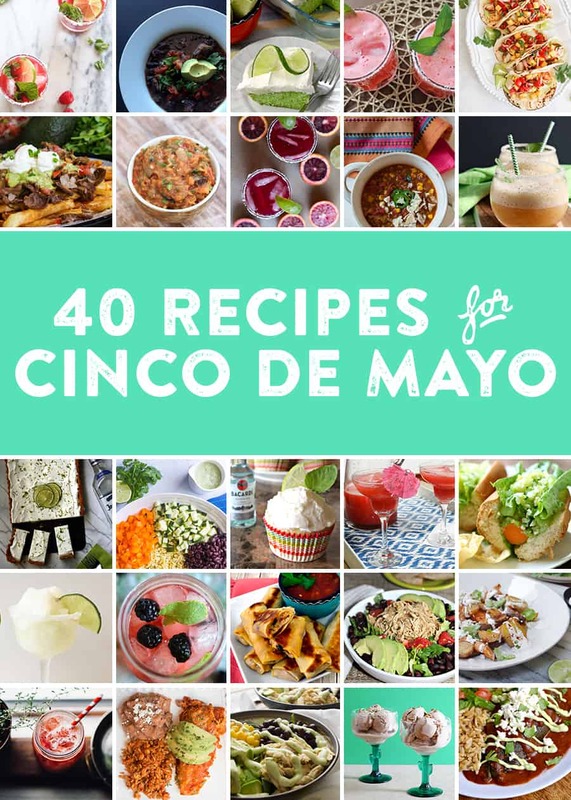 I’ve teamed up with some of my blogger friends to bring you 34 Cinco de Mayo themed recipes! We’ve got ALL your fiesta needs covered. Be sure to check them out below. 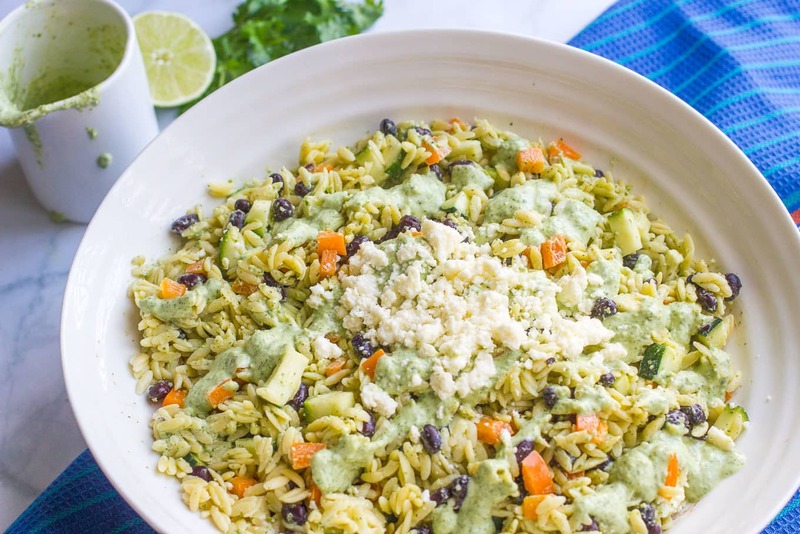 I made this southwestern orzo salad recently when my husband’s best friend was over and having dinner with us after the kiddos were tucked away in bed. We devoured it and I had only a small bowl left the next day. This pasta salad is cool and creamy, with a hint of background spice from the jalapeño in the dressing (but not spicy or my kids would have been dramatically grabbing at their tongues) and it’s got a great bright, fresh flavor bursting through in every bite. You need to make this salad in advance to allow the orzo to cool, so please plan accordingly. I like to get whole wheat orzo when I can find it, but it’s not available in many stores. Also, this recipe calls for 10 oz., which is not the whole box if yours comes in a 1 lb. package like mine. It’s about 2/3rds of the box (I eyeball it). Queso fresco, or queso blanco, is a mild white Mexican cheese. It’s available in most grocery stores, but if you can’t find it, you can substitute a mild feta cheese (a French style one, not a Greek one) or a mild goat cheese. 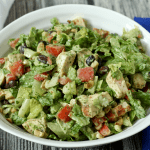 If you’re making this ahead, I recommend you keep the dressing separate and mix it into the pasta salad just before you serve it, so the flavors stay nice and bright and fresh. You can also add some extra lime juice and cilantro to punch up the flavors when serving. 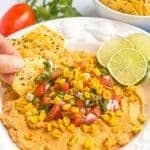 Be sure to check out the other Cinco de Mayo recipes below from some of my blogging buddies. 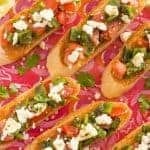 So many great ideas for your fiesta! 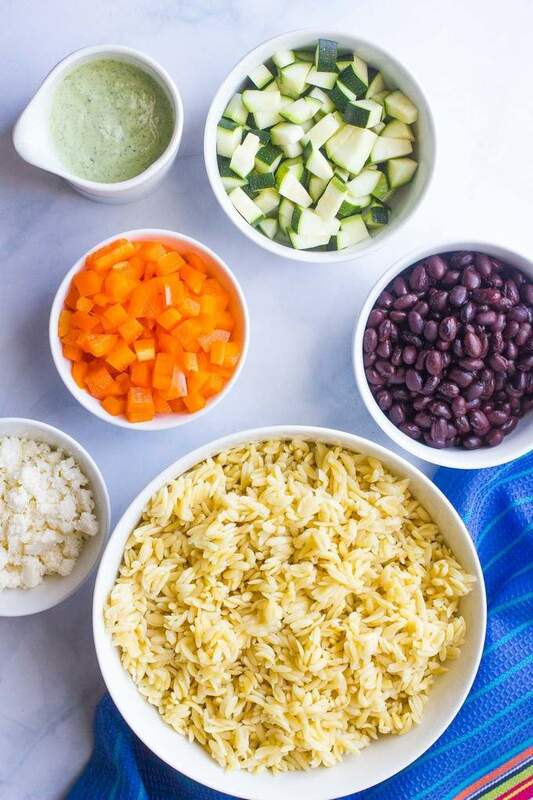 A cool, creamy southwestern orzo salad with black beans, veggies, queso fresco and an easy homemade cilantro-lime vinaigrette. Cook the orzo in salted water, according to package directions. In the meantime, add the chopped zucchini to a large bowl. Drain the orzo pasta and pour over the chopped raw zucchini in the bowl. This helps soften the zucchini slightly. Let the pasta cool. Once cooled, stir in the black beans, peppers and queso fresco. You can refrigerate the salad at this point if you’d like. 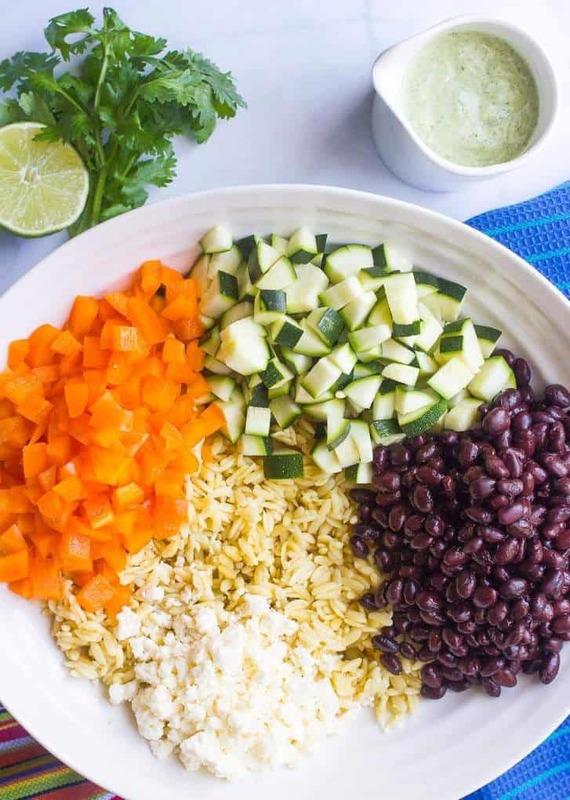 Make the easy creamy cilantro-lime dressing. If making ahead, store it separately. When ready to serve, stir the dressing into the salad, mixing well to combine. Season, to taste, with extra salt and black pepper. 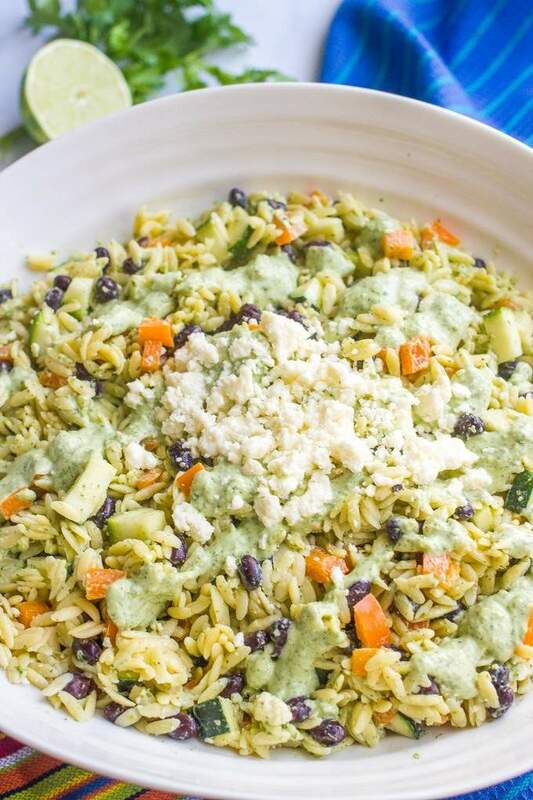 Serve the orzo salad cold or at room temperature with extra queso fresco crumbled on top. I like to get whole wheat orzo when I can find it, but it’s not available in many stores. Also, this recipe calls for 8-10 oz., which is not the whole box if yours comes in a 1 lb. package like mine. It’s about 1/2 to 2/3rds of the box (I eyeball it). 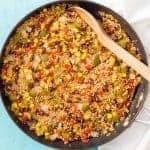 If you're making this ahead, I recommend you keep the dressing separate and mix it into the pasta salad just before you serve it, so the flavors stay nice and bright and fresh. You can also add some extra lime juice and cilantro to punch up the flavors when serving. If you want to make extra pasta or double the recipe, be sure to make extra dressing, too! 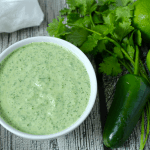 Here's the link again for the creamy cilantro-lime dressing recipe. Also, don’t forget about the awesome Amazon gift card giveaway – it’s still open so get your entries in!! What a beautiful and fresh salad! Snow hear again last night so no flip flops or shorts here for me just yet, but I can certainly eat this salad and dream of sunny days…..I absolutely love the lime cilantro vinaigrette you have on here. I guess that’s a good thing that you didn’t get to eat a lot first time ’round…that means everyone loved it 🙂 Pinning for later. Have a lovely upcoming weekend, girl! Oh I love love looove anything southwestern, especially when it’s a light dish like this! This orzo looks fabulous, Kathryn! You packed this beauty with a ton of delicious ingredients and that creamy, zest vinaigrette sounds like the perfect way to finish this off! Makes me thankful I don’t have kids, because I know I’m not going to want to share this dish! 😉 Pinned! Cheers, friend! Yum! Clean and fresh and just gorgeous! Thanks for linking up with us on Throwback Thursday! Orzo is absolutely one of my favorite foods, and this recipe looks delicious! 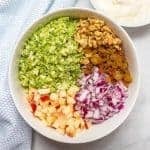 I took a peek over at the dressing recipe, and I am going to have to try this whole kit and kaboodle. Thanks for sharing on #FoodieFriDIY! Thanks so much Martie 🙂 It’s a great combination – perfect for spring! This looks like the perfect meal for warmer weather! 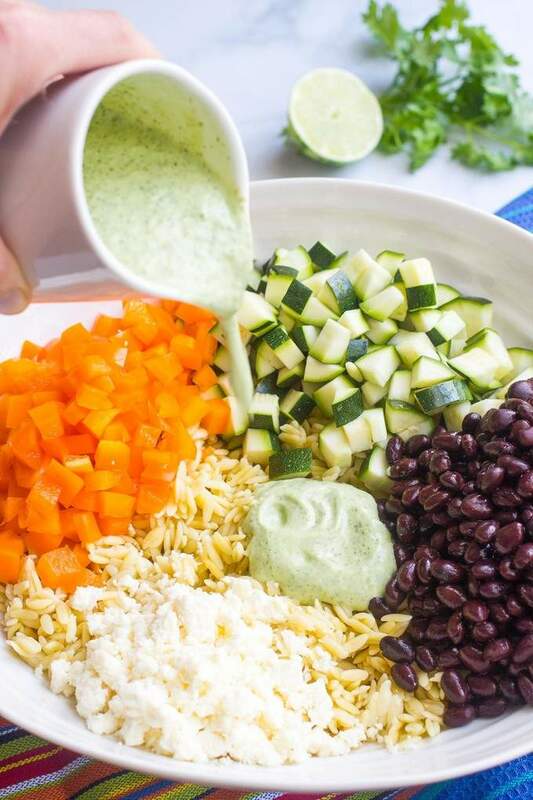 The creamy lime cilantro vinaigrette looks like something I could eat by the spoonful, and I agree – cheese is never a bad idea! I’ve got a chunk of cotija I need to use up, so I’m thinking I could use that in place of the queso fresco in this recipe. It’s definitely spoon-able 😉 And yes, cotija would be great here too! Great recipe, great video! I really never use orzo, I just use different pastas, or use grains. I need to buy some orzo! Thanks Mimi! Orzo is always a fun pasta to incorporate!